Tipsy Canoe Designs, started by Caitlin Barter in the summer of 2016, has a simple aim: to tell the stories of the people and places of a small town through functional artwork. Caitlin is a 20-something from Cascapedia, Quebec, a small town located in the Gaspesie best known for its fly fishing. Fishing and canoeing on the East Coast, and especially in the Gaspesie, is not just a part of life- it's a lifestyle. It's ingrained in your very being, it's the essence of home for many. 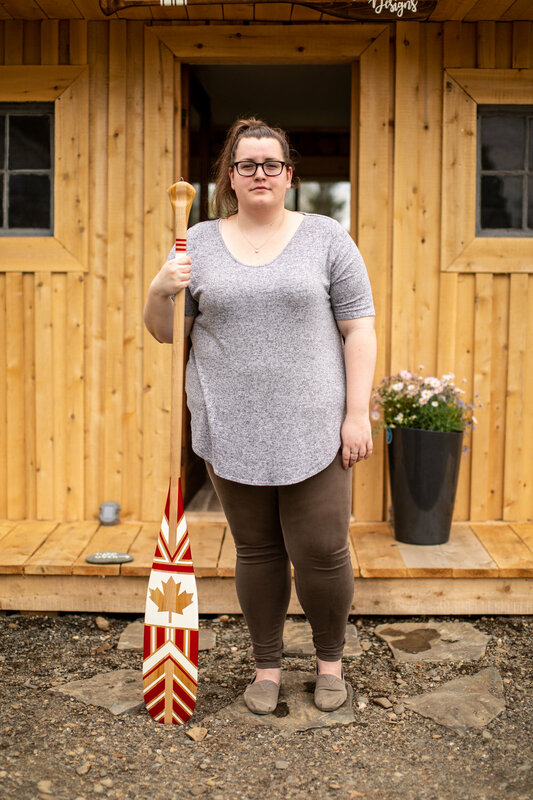 Painting in some respect for most of her life, Caitlin has merged her love of the outdoors and painting to create one of a kind canoe paddles inspired by the Gaspesie but also the Canadian small towns she's travelled to and through. Fly fishing and canoeing with her father (a fishing guide on the Grand Cascapedia River) since she was a child, Caitlin has never been the graceful type. She rarely goes fishing without coming back with wet feet. Every boat that Caitlin steps into is a Tipsy Canoe. In early 2018, Caitlin expanded her focus to include clothing with a Gaspesian influence, toting phrases like River Rat and Gaspesian Built. These shirts as well as paddles, earrings and paddle hangers can be found in her new shop which opened in May of 2018.